It's the second time that I order the Orangeade Minute Maid. The first time was at the location inside Walmart in Brownsville, TX. I had it remade because it had chocolate chips in it. Today, I ordered it from the location on International in Brownsville, TX to go. I'm seating in my office drinking an orangeade that tastes like coffee. The first time I was told that they use the same blender for coffee and slushies and that's why they come out that way. THAT IS VERY WRONG!! And I'm pretty sure there's a poor food safety problem there. We order slushies not slushies that taste like coffee. McDonald's should provide their locations with 2 blenders one for coffee and one for slushies so these type of things don't happen. And the staff has got to CLEANED THEM!!! It is gross and disgusting what they do!! On several occasions I have waited in the drive through line for some time before being asked for my order. Tonight there was no one else in either of the 2 drive through lines and only 2 or 3 cars on the parking lot, and yet I had to finally ask someone to take my order. Tonight about 8:20 there were 2 other drive-through customers sitting waiting in the 2 reserved spots for their orders and I had to pull up next to the door rail and wait for mine. Recently my wife went inside to place an order and waited much too long for her order. She said one other customer, a man, got fed up waiting and walked out. The location where we have had this problem several times, is at Rodney Parham and Breckenridge Drive in Little Rock, Arkansas, the location nearest our home. I asked the girl who finally brought my order out (the other 2 cars were still parked and waiting) if they were short-handed and she said yes. I don't know who owns this Little Rock franchise but I may check records to see. They need to know what's going on. It is a frequent occurrence here. We also occasionally go to the Cantrell Road location and the West Markham location and have not had these exasperating delays there. We usually go to McDonald's on the average of once a week. I know that is not meeting your standards. I might suggest you have an inspection team go around and check all your franchises and make a written report to the home office. I think it would be money well spent. Your company is held in high regard in comparison with your competition, but incidents like these can cost you your high rankiing if they are endemic. Went to McDonalds for breakfast this morning, Saturday, October 21, 2017, at the store in Meridianville, Alabama, and my wife placed an order for an egg, bacon, and cheese biscuit. Upon receipt, the bacon was cold and there was no cheese. When queried the manager delivered an new egg, cheese and bacon biscuit. Again, the cheese was cold, as well as the bacon. We left the place, and told our car club about the experience. Our club was meeting there for a day long drive out. The manager did nothing to remedy the situation. Again, I have told many people of our experience and will not patroniz your place again. You may reach me at 2566035772, address: Mr Alspach, 224 Woodland Lake Dr, Laceys Spring, Alabama, 35754. Yesterday I stopped at Mcdonald's in Spring Hill, I ordered 10 chicken tenders with buffalo sauce, when I got home I had 10 chicken nuggets I paid $10.32 for. I call the store spoke to Manager Marsha, very professional and concerned, I explained I live off 50 and I didn't want to drive back to there, she understood and asked if I would go to the one on 50 she would call the manager and I could go through the drive thru. I thanked her and I went to the one on 50 took the nuggets and my receipt with me, explained to the person in the drive thru she got the manager he asked if I had my receipt yes I do, he came to the window took the nuggets and receipt told me to pull up to the second window, the girl there said for me to pull into one of the parking places, well, 20 minutes and several employee's asked if I was waiting on various orders that were not mine, finally after 5 more an employee brings me my tenders , no sauce, I just left I was over it. I stopped at McDonalds at Slaughter Lane and Manchaca in Austin Texas at approx. 6PM today, October 20th. I entered the store and waited more than 10 minutes for someone to take my order. I finally asked a McDonald's employee if someone could take my and other customer's orders. With no apology for making us all wait, your employee stated that they were too busy filling orders for the drive-up window and we would just have to wait and she did not say how long that wait might be. Taken aback by the insensitive remark, I left your McDonalds store and it will be an extremely long time before I visit any McDonalds store. Something needs to be done about the poor customer service. Purchased your new item, Chicken Tenders, Saturday 10/14/17. What a soggy, wet mess I received. Chicken Tenders were awful, I have had some bad experiences with some items from your menu, but this was way below your standards. I did not receive a receipt for my purchase. The McDonald's is located at 6409 W. Bluemound Rd. My granddaughter and I went to the McDonald's on Fairview Avenue in Montgomery, Alabama at approximately 8:00 p.m. We had gone through the Drive through and I ordered the buttermilk crispy chicken for the two of us and two slushes. After paying for my order we receive the two slushes, but we had to wait for the chicken. So we were waiting and I drank out of my granddaughter 's drink by mistake. She of course got upset, so she went in to see if they would give her another one. The manager told her she had to bring in the other one, but I had already poured the rest into my cup. So I went in to see if I could get another one and ask since we had been waiting for at least 30 minutes, if I could get a complimentary slushy for her. The manager then began to say no,we don't give out free drinks, and if you want one, you will have to pay. So I began to give her the money and she pointed to the line and said you get in the line like everybody else.Then she began talking about me to her friends like I wasn't even there. So I said excuse me, and she came to the register to ring up my order. Now a young lady was already there but, she wanted to show her control over, so continued to talk to me in a belittling way. So I asked for a small slushee, and she said we don't sell small, all in a nasty voice. I then told her that I didn't want it. She then told me to get out , get out of her store right now. I didn't move so she had the security to put me out and the security was a big woman who literally push me towards the door until I told her not to push me again, but she did it three times. I am 61 years old, and about to be 62 next month, and I never been treated this way in my life. I am a regular customer of all the McDonalds all around Montgomery, Prattville, and surrounding towns. I am just glad my granddaughter was in the car because we would probably both have been locked up tonight over some foolishness. The young lady is named Eleanor Givner, and she is very rude and inconsiderate. She yelled at me in that store and other people were in there and they were just looking surprised. Other workers were scared, they wouldn't even give me a number to make a complaint. I had to come home shaking and find another manager to get the district manager and call in a complaint.She litterallly has the workers scared and she is very unprofessional. I hope you can get someone else to do that job, because she is bad for your business. We took our granddaughters to your Yanchep store for a treat, what a joke. The tables, chairs and floors were dirty, the rubbish bin was so full you couldn't put anything in it. The staff were to busy playing ball games. I spoke to some young man who said he was the manager and told him how disgusted we were with the condition on the shop, he said he would get someone to clean, it was still dirty when we left. Also it is the only McDonalds store that doesn't give seniors discount unless you buy a happy meal. Our first and last visit to that store. 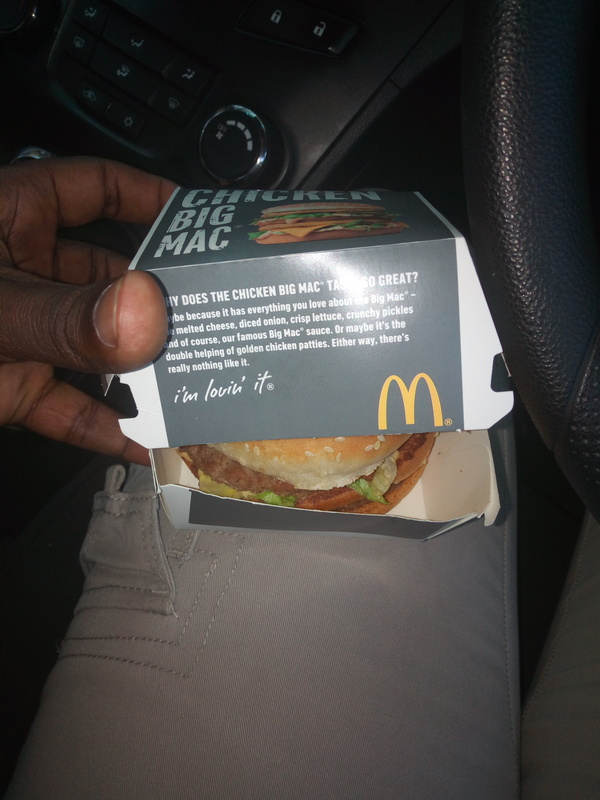 I went to mcdonald westdene, Bloemfontein with my family, the order was mixed up, chicken big Mac is beef, I bought happy meal for kids n there was no juice. Cream soda tastes like water even the water that I paid for I didn't get. Staff members were fighting at a window. I wasted my money and my time. the order total on one price than it was cheeper . i know that they combined and make meals to help with pricing. Paid and pulled to next window. they asked me to pull ahead was a wait on the Butter Milk Chicken. so i did . I waited for 10 min. the person came with my items and I stated that the order did not look to be enough. so i checked the order. they forgot the 3 large fires. so she ask for my reciept i gave it to her . she stated that the fires was not on there. so she said she could go and find out how much it would coast . I gave her a 10.00 bill and told her to just pay and bring them out. I made statement that the time i had to wait they should be free. and also stated the kid that took order must have deleted the order instead of putting it into meals. so she went in and 2 or 3 min went by . she came out with my money and said no charge but there was a 37 sec. wait on fires. my point is i already waited 10 min for order to begin with. than messed it up and was paying for french fries and yet instead of just waiting on the fries and bringing them and my money same times would have saved time for me. i took my 10.00 back and as she walked away she was walking so slow looking around i just left. this is not the first time that i have waited and have found order messed up and than have to wait again i do not know what is wrong with the McDonald in Paudling Ohio but it is the most aggravating McDonald i have been too. poor service , too slow and always messing up orders. I went to McDonalds in Farrarmere. How disgusted am I after I left there. I bought a CHOCLATE OREO MCFlurry and obviously expect everything to be in order. When I got my mcflurry there was no sauce on top and when I asked for sauce they only gave me a splash. Could have leave it instead. I am as a usual mcdonalds customer highly disappointed after the service of today. I am very unimpressed with the attitude of this manager this morning on 10/13/2017, l often visit this location and witness the manager announcing after a several minutes of waiting on one single lines, that there is always two lines at all times, two cash register is always open. Well this morning I entered there were two customers on one being rung up by the manager on another line so I waited on that line, she then called someone else from the other line ignoring me, she helped that customer and was calling another one so I stated politely that I am standing here, she then rudely stated there's only one line and I am pulling from that line another customer who walked in after behind me said to her she was here let her go before me, I then said to her you stated before that there are always two lines, I reminded her of that and then I walked out before she could further embarrassed me. I find her attitude to be very aggressive and I will advise my friends who often eat there to be aware and to pass the word along to their friends. This location's manager needs to receive some customer service training, I walked away because I would rather file a complaint than to agree with her. I spent my money elsewhere and received great customer service. This is the 2nd time I've had a problem with this Mc Donald's. I went through the drive through on 10/10 and my bill was only $4.32 but today I checked bank statement, I was charged 2times for same amount. Location is across from memorial Hospital/Greenville S.C.
Just wanted to let you know, there is nothing about "FAST FOOD" that applies to the Mcdonald's in Connellsville, PA (Memorial Blvd). Average wait time in the drive thru (during evening hours - after 4) is 15 minutes. Actually, tonight's wait was 17 minutes at 8:30. I believe the problem is, not moving people forward to one of the two spots reserved for people waiting on drive thru orders. They will seriously keep customers sitting in line at the window (waiting on orders) before moving them forward, so the drive thru line can flow. And I think this is ridiculous. Word around town is "Connellsville's Mcdonalds is the worst!" and I have to agree. The McDonalds in North Sioux City South Dakota has everyone complaining. Wait tieme for food is 30 minutes. At 10:15 E.S.T. the Assistant Manager was belligerent and would not honor a Survey for a buy a sandwich, get one free. I also spoke to the Manager and Franchise Owner Manager and received lip service. Very poor way to serve a McDonald guest. There is a lady that works at the McDonalds on Staples Mill Road in Henrico,VA. She is an African-American lady who has a few tattoos, some piercings and has a skinny build. I want y'all to know she is the sweetest, nicest lady. She's always polite and attentive to the customer. She had mentioned to me one day going through the drive-thru she had a son and that he played football. Maybe a program or something to help her pay for the cost of her son playing sports would be pretty cool. As well as help other employees like her. I am so proud of her for getting a job with y'all so she can support her family. She honestly deserves a raise and a promotion. This morning 21st of sept about 830am in new town Wellington Mac Donalds drive through, I had a incident with one of the staff members there. As I pulled up in the drive through I had wined my window down as I attempt to turn my music down the team member over the speaker said turn your music down and don't be so rude, before I could turn it down.due to volume button faulty. eventually had turned my music down then told me he wasn't going to serve me and to leave the drive through I thought that was abit rude and asked for his name he refused to give me his name and left fuming because I was late to work getting my sons breakfast down at the basin reserve Mac Donalds then back to day care in newtown. That was bad customer service and I am a regular customer to that Mac Donalds because I am local BuT having that experience this morning wasn't a good start to my day if this could be actioned and dealt with that will be much appreciated. I went through the drive through the drive thru at that location on 183 and Central . I ordered 2 cheeseburgers large French fry and large chocolate shake . When I go to the window for my food - She attempted to hand me the shake, I told her I asked for a Large Chocolate Shake.. She told me that it was a chocolate shake, I told her is was not. She again insisted that it was, The shake may have had some chocolate syrup in the top part but the bottom of the shake was white. I do not like vanilla ice cream and asked her if they could put chocolate in it and mix it up .. (Hence the request for chocolate shake) . Someone came and got the shake and the girl asked me to pull up to waiting spot 2. I told her ok , as I started to pull off she told me to hold on, so I waited, she hands me the shake and it looks like they might have attempted to mix what little bit of chocolate they had on top but didn't even mix it . I didn't realize it was so difficult to make a chocolate shake, but it appears that you are overloading the location with so many types of coffees, drinks, slushy drinks they don't know how to make them. I took the shake from her hand and told her I was not happy with the shake but apparently they didn't understand the request . As I am leaving to pull out of the parking lot to head back to work with my food- I reached in the bag to get a French fry- (which was really why I went to McDonalds) and the fries were cold . ARE YOU KIDDING ME . Trying to rush me out of the drive through line , cant take the time to mix a shake properly and then give me cold fries. Not life threating issues of course but very disappointing. I won't be visiting that location again but I thought you should know how horrible the service was . And it was 11:40 am. I don't have a problem waiting a few minutes for my food to be done right . I do however have an issue with poor service and cold food. I ordered breakfast on September 18. Two gift cards were swiped and they both said: transaction not approved. I was not given a response as to why two cards were not going through, such as: maybe the system was down. Is there a way that workers can check to see if systems are down? Just imagine the embarrassment of having 2 cards rejected! Fortunately I had my American Express card with me, so I was able to have breakfast this morning! I called the McDonalds 1-800 number to check my balance and there was money on both of my cards. This happened at the McDonald's at Louetta Spring Crossing, Spring, Texas. After going to McDonalds on Southwest Boulevard in Tulsa, OK for over 4 years every other morning during the work week, I had a terrible experience with this McDonalds and will never, ever go back. I saw the add Sunday night for either a sausage muffin or sausage biscuit with a hash brown for $1.50. We went there this morning and requested the muffin and hash brown and they told us that they did not have it. We got to the window and asked why they did not honor their TV add since they do have muffins and hash brown, seems simple to me to honor the add and not hold up the line and argue with us and make a regular customer mad, but they chose to do this anyway and were hateful - I will NEVER go to McDonalds from now on - Carl's Jr. here I come!!!!!! In Cape Town there is a taxi strike this morning. This morning, as I do every morning after I drop my child at school, I stop at the Plattekloof McDonalds for a cup of coffee since I only have to be at work at half past eight. The time 7h42. Upon getting there, I tried to open the front door, but was shown, via a hand sign by the person behind the counter, to " go around", which I interpreted to be the door around the corner. Get there, but that door is also locked. Back to the front door and knocked, only to be shouted at by the person behind the counter that " their is a staff shortage, go around to the drive through". 1. - you don't shout at the customer from behind a closed door. 5 - oh!, and the best of all, there were customers inside the restaurant already. How did they get there? 1. As I mentioned, I am a regular customer who orders coffee every morning. Every morning I have to ask to be given a tray, not offered. 2. No eye contact is made when I place an order. I have to fight with the conversation going on in the background ( between the personnel) to be heard. Not a "good morning, please may I take your order". 3. Trying to have a telephone conversation on your cell phone or the person sitting across from you, is out of the question, since the conversation between the personnel is too loud. This is not the way I am used to or expect to be treated as a customer. The personnel is not at all client orientated, and carry on as if they are in their own kitchens at home. NO, absolute NO professionalism whatsoever. NO pride in their work. The customer are treated as an inconvenience which have to be gotten rid of as soon as possible, so they can continue their private conversations. Please address this matter urgently, since this branch of McDonalds are not living up to expectations whatsoever. On Saturday sound 7 pm I entered the Foote Ave location and placed an orderived for 3 adults and 4 children. I waited over 20 min for my food, patently bc I myself worked in McDonald and know dinner time is high volume. When my friend received his promotion sandwich the chicken gauqamoly, the chicken was dry to the point we couldn't even bend it to brake. When my friend asked politely for his chicken to be replaced he was told it was with in shelf life, and if he wasn't happy with that chicken he wouldn't be happy with any chicken. And there was NOTHING HE COULD DO. I then approached the counter and asked if he really just told him there was nothing he could do. I myself was a manager and know it's nothing to just replace the chicken on a $32 order. So I then took out my phone to take a picture of the sandwich and get his information to report to corporate. At that point my husband then began to record. The Manger tells us we need to stop talking pictures and videos now he will have us arrested. At this point he go's back to the office, I had recieved the information I needed and went back to the play area to join my kids. About a 30/45 min later an officer came to excoriat myself and my children off the property. I then upset and in disbelief posted a picture of the food I received and explained the situation. At witch point Deny Coca, his friends, and a few fellow employees begin to comment there opinions. 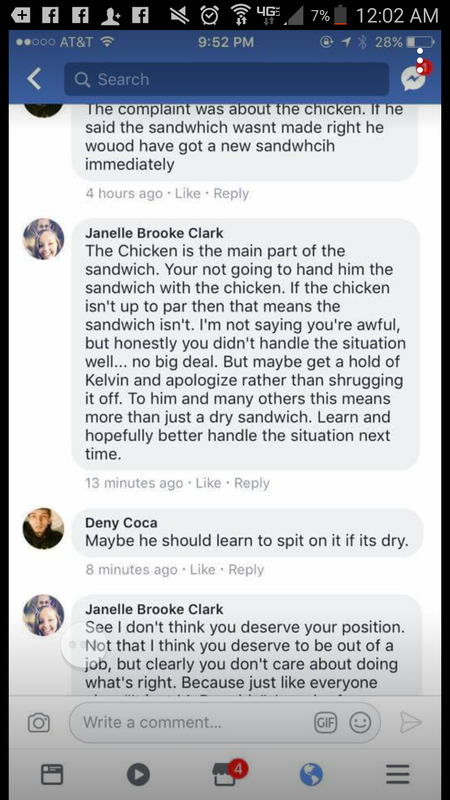 Comments such as "we should have spit on it if it was to dry" to "his manager said he was in the right" . I myself have worked for the company and know that this is not corporates hospitality standards for management. I do not reflect one person actions on the company. I do expect the issue to be addressed. Manager refused to let an African American United States Air Force Veteran into his store in Castle rock Colorado at 1100pm. His reason was that he had no employees.Meanwhile an elderly Caucasian man was standing in the store waiting for someone to take his order. This was the exit 194 McDonalds. I usually never have a issue with McDonalds, But the one tonight we went to pick up food at was terrible. I love Big Mac's and the fries are the best anyplace but when we got to work with our dinner it looked like our dinner went thru WW3. We are in Des Moines and went to the McDonalds on University Ave by Mercy Hospital. My god the fries were cold and burgers were all tossed in the box, Literally had to re-make them before we ate them. Its what Grandpa wanted for dinner in the hospital. It was very sad and the worst experience I ever had. Like I said I never complain but never ate at this one also. I always go to Urbandale where I live. I was so disappointed cause it might be Grandpa's last Big Mac and it was horrible. I will not ever use this one again and start going back to Burger King by work. Sorry even though your fries are the best around. The Cameron Park McDonald's is by far the worst McDonalds ever.They run out of certain items. They do not have specials as advertised on t.v. and the help is poor to say the least.I end up going to Taco Bell a couple of doors away and everything is run like a fine tuned machine.Sorry for the lost business but someone needs a good quality check on this location. I love my Mc Cafe drinks. But when I try to buy 5 and get one free it fails to give me my logo. It has happened at least 3 times now and I am tired of it. What can I do.? I am a retired lady and I want my coffee. By the way I love those drinks. Please help me. I have at least 3 logos coming. Came through Mcdonalds at 18250 NW 27th Ave at approximately 6:30 this morning which was September 1, 2017. The lady that took my order was very polite and energetic, her name was Mrs Janet, she's very professional. I'm garunteed to get awesome customer service when she's in the drive-thru. I haven't seen anyone else demonstrrate this type of service. I paid with my credit card, she informed me that the credit card machine was slow. It took 7 minutes for my payment to go through. Mrs Janet was very attentive to me as I waited, she apologized at least 3 times. Mcdonalds needs to do something about this. Went to Mc Donald drive through on Spruce and Iowa in Riverside,CA I ordered a number 4 double quarter pounder meal. Just one meal. paid went to the window received my soda and was told to go to window two. Well nobody was at window two. After watching seven or eight cars behind me roll up get their food and leave at window one. I was frustrated it was 108 degrees outside and I'm stuck waiting. after ten minutes I left. Tried to call but the phone just said voicemail hadn't been set up. I got that message for half an hour. I don't know what their excuse is quite frankly I don't care. What I would like to know is Does McDonalds simply not want me at their establishment? It's an honest question. On today's date, 08/28/2017, I went to the Mcdonalds located at 17850 NW 57 ave miami, Fl. 33055. At the time of the visit, I went through the drive through and ordered a double cheeseburger which according to the sign was $1.69. When I got to the window to pay I spoke with a rude manager named Yaleny (would not give last name or id #). Yaleny stated that the price was $2.19. I told her several times that the price they have advertised is $1.69, she said no. I said every Mcdonalds I go to it's $1.69 she said so. She proceeds to tell me that she is pregnant and doesn't care. She was laughing and being unprofessional. There was also a worker behind her being unprofessional making comments about it not being a big deal. I know Mcdonalds does not care about any one customer but at the very least your workers should be polite and be able to explain any differences in price. All I wanted was for the price advertised to be honored. I left this Mcdonalds and went to one at 16701 NW 67 Ave and the price was $1.69. I believe Yaleny doe snot know what she is talking about, I know her English is not the best so I spoke to her in Spanish but she still did not understand about there being an error in the price advertised and the one that is being charged. Went to the newly built store on the north belt highway in St. Joseph in Missouri. The service was so slow people were pulling out of the drive though lane and going somewhere else. This store, before it was torn down, had the slowest, laziest, employees I have ever watched work. My guess is poor management. McDonald's needs to start over and rethink their hiring practices. I love McDonald's and would hate to see their business fail. Me and my son always we go to McDonalds in Mecca Maca mall. I asked for happy meal with 6 pieces but the lady on the cash did not know how to do it because I asked a toy with it. The same manager who always I had issues with him interfered and raised his hand and point it into my face (it was after 9 o'clock evening on 10,08.16) . The manager in duty his name is Mustafa is always rude and I do not believe that he should represent such well know chain like McDonald's. I officially raised a complaint by calling the phone number for the store by the manager hung up on me. So, I hope by posting it at Hissing Kitty I get some help! I sent in a complaint last week and I received an email back giving me some dumbass link to go to. I went to the link and it sent me right back to this page. I emailed back asking for explanation about what to do and heard nothing back! The last time I had to complain about this store I wasn't given this link so why this time? Pretty bad when the complaint department gives you the run around! So who do you complain to about the complaint department? My initial complaint was about the McDonalds at 45th and Teckla in Amarillo Texas. Don't know the store #. Short version of my complaint, they are slow and never get orders right. Sat in drive threw for at least 20 minutes. 10 of those 20 minutes was being asked to pull to the side because my order wasn't ready yet. It was a Large Iced Carmel Mocha for crying out loud! Which by the way, they never get right. I always end up with a Chocolate Iced Mocha which tells me they do not know the abbreviations. They got 3 other orders wrong in this 20 minute waiting period. Last time this happened and I complained all I got was a sorry about your bad luck. Not going to cut it this time! Not only did I get the wrong thing, I was late to work because of it. This needs to be fixed. Not only with me but with this store. And I don't want an email back telling me to go to some link that sent me back to this page. Something strange and disgusting inside of my breakfast hash brown. McDonald's double drive throughs are absolutely ridiculous! People don't pay attention as to who's next, but assume they are! These drive throughs cause too many problems! Most people have an equivalent 5th grade knowledge capacity, so this is too confusing for them. They should really please find a way to "dumb this down!" I went to the drive-thru at around 3am one friday night. Not a customer in sight. First of all, I waited 8 minutes for someone to take my order. Then I paid for it and went to the next window. There were , at least 2 employees in there. one white girl and one black. They glanced at me and snickered, a lot. After about 10 minutes, i went home. I have been ordering a sausage and biscuit every morning for several years. I have noticed lately that the quality of the sausage is terrible with fragments of bone in every patty. i usually go to the Mcdonald located on the corner of Nettleton Ave and Caraway Rd in Jonesboro, AR. but lately I have switched to Burger King. I went to get a fish filet at McDonald's in beamsville on at 4:30 Tues 2016 the fish was over cooked and the cheese was dried out and hard. This is the first time it happened it must of been sitting for hours for it was not even warm, if this how they serve (hot ) food then it will be my last. There is always A&W and Wendy's. Every Friday night and sometime during the week there's a bunch of employee in the store none of them working and the McDonald's On Essence Lane, Baton Rouge is always closed before time or the frapple machine is always broke. I thought the purpose is to make money, not have a bunch of lazy people on the clock Friday at 11.30 they are close several cars pull in an was told they are closed I reported this to management once before.